The owner-builders needed more space in their small Art Nouveau house for the family and for a psychotherapeutic practice. The architectural solution was a free-standing cube-shaped addition, attached by a skeletal staircase, in a design that respects the original building, leaving its proportions unchanged. 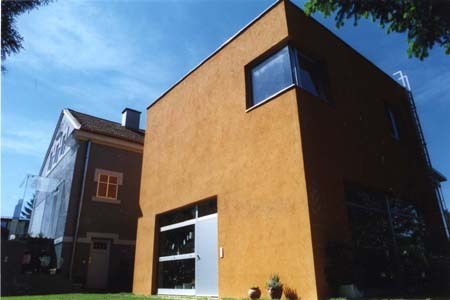 The simple cube oriented towards the garden is defined by its orange colour, while the façade of the existing structure was renovated true to the original. The new vestibule is a glass construction that provides a contemporary accent to the side facing the street.